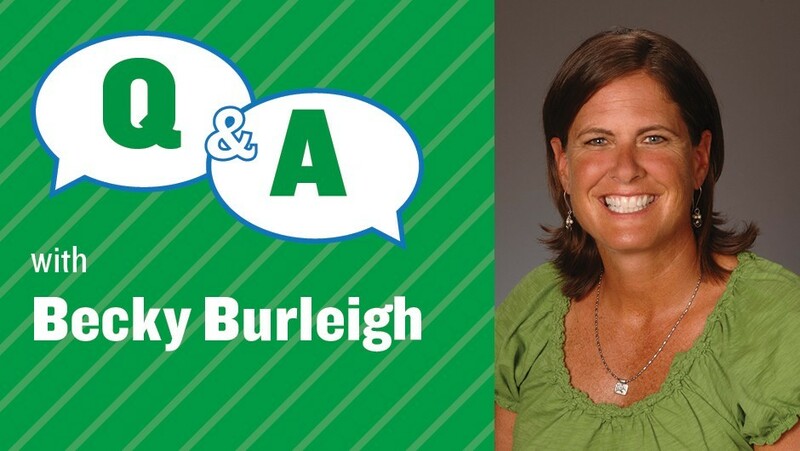 University of Florida Women’s Head Soccer Coach Becky Burleigh will be at Big Swim Big Kick on April 28. Kids will have the opportunity to meet Becky and kick around the soccer ball with one of the best college coaches in the country. Her passion for the game was evident since the day she received her first pair of cleats. She remembers putting them in her room on top of the shoebox like they were a display. Becky’s drive eventually landed her the job as the inaugural women’s soccer coach at the University of Florida in 1994, a position she holds today. In her 23 years at the helm of Florida’s program, her teams have consistently been among the top ranked. We caught up with Becky and learned what keeps her motivated, how she has evolved as a coach, and how sports have impacted her as a person. Q: How did you get into soccer? A: My family moved from Massachusetts to Florida when I was 10 years old, and our new home was across the street from a field. I had never played organized sports before, and my parents thought it would be good idea for me to get to know more kids. I loved it from the beginning. I immediately had a group of 18 built-in friends. A: I met my first professional coach in college (Methodist College in Fayetteville, N.C.). I knew immediately it was what I wanted to do. [After I graduated], I coached for five years at a small school. When the University of Florida [announced it was planning on adding a women’s soccer program in 1994], I knew it would be successful because there was so much talent in the state. From there, it was a matter of putting in my resume and lining up some interviews. I got the job. Q: What do you love most about coaching? A: It’s interesting because although the strategy and tactics are similar, the team dynamic changes year after year. Working with so many different people is really exciting. Q: You started the program at UF and catapulted to NCAA champions just a few years later. What was the key to success? A: I do think there was a lot of interest in kids going to Florida because it’s such a good school. [Prior to 1994], it wasn’t an option [for soccer players]. Once it became an option, [we recruited] some good freshmen, had kids transferring in, and gained a couple of people from the already-established club team at the school. It was an amazing feeling [winning the NCAA championship in 1998]. [We beat the University of North Carolina in the finals]. We had played them multiple times, every spring, and they always killed us. It was cool to [get the win] and see the progress. Q: You have coached some of soccer’s bests: Abby Wambach, Heather Mitts, Danielle Fotopolis. What is it like coaching athletes of that caliber? A: I think I have definitely evolved as a coach [since Abby, Heather, and Danielle came through the program]. There is some responsibility [in coaching athletes of that caliber] because you’re trying to bring out the best in them, but it is also exciting to work with talented players. A: Staying motivated is not hard. There is always another interesting challenge ahead. Q: What types of challenges have you had to overcome? A: I’ve been coaching for so long that a lot has changed, and I’ve had to evolve. I’ve seen generational differences and changes in technology. You continue to reinvent yourself. Every year is different. I cannot rely on what happened last year. Hopefully my experience plays into my ability to [continue to improve] as a coach. Q: What do you look for in a recruit? A: Besides talent, it comes down to character, as a teammate and as a performer. [I look for athletes who are] resilient and have the ability to bounce back from mistakes. Trust is also a big part of the way we play. You have to be hard working and have empathy; the ability to relate to your teammates is important. Q: How have sports impacted you as a person? A: I’ve learned over the years to deal with a variety of personalities. I’ve learned how to be in an organization where I have to manage up and down. All of the character lessons that you learn on the field apply as a coach. You have to be resourceful and adaptable. Q: Why do you think it is important for kids to play sports? A: Sport forces you to be in environment where there are people who are not like you at all. It is one of the few places left where there is forced interaction with people who are not necessarily of your demographic. Q: What advice do you have for kids who want to pursue college athletics? A: There is a level out there for everyone. I played division 3, and I wouldn’t change that. I got the opportunity to play a lot of minutes. You have to pursue it, and you have to pursue it hard. Sell yourself. Q: What do you do when you aren’t coaching? A: I really like going to other sporting events at [the University of Florida]. I also love adventures: scuba diving, skydiving, whitewater rafting, and traveling. A: I’ve heard a lot of amazing things about Asphalt Green. I’m excited to be in the environment.